Serbia cherishes its political neutrality, staying away from global confrontations - but how is that going to go along with its EU membership aspirations? 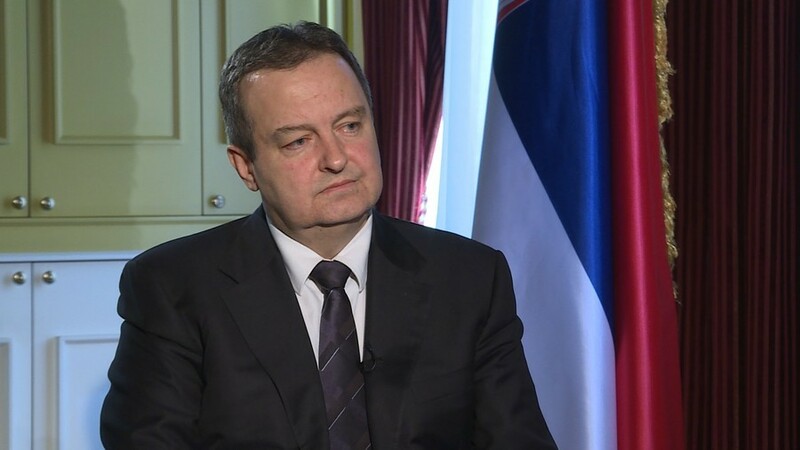 We talked about it with Serbian Foreign Minister Ivica Dacic in Belgrade. Sophie Shevardnadze: Foreign Minister Dacic, it’s great to have you on our programme one more time. It’s been a couple of years already. Lots to talk about. President Vucic wants Serbia to join the EU but he also says there’s no way he will allow Serbia-Russia’s relations to go sour. You know, EU-Russian relations are right now not at its best and we don’t know when they become better. So seeing how all other EU members fall in line regarding sanctions against Russia, why do you think you’ll be able to defy Brussels when the time comes? Ivica Dacic: We live at a time of anti-Russia hysteria in the world. When I was in the White House and talked to the National Security Adviser McMaster he literally said that the American influence is good and the Russian influence is harmful. In case of Serbia it didn’t prove to be true in the past, seeing how over the past few decades many principles of the international law have been violated in the example of Serbia. First of all, the borders of Serbia have been changed by recognition of the unilaterally declared independence of Kosovo. Serbia belongs to Europe geographically, politically and historically and it’s only logical that our interest in becoming the member of the European Union is based on, I would say, our personal experience. I held different positions in government - as Prime Minister and as the Minister of Foreign Affairs - and I’ve never heard anyone from the Russian side speaking negatively of our wish to join the EU. The only thing that Russia expects is that it will not result in an anti-Russian position which Serbia is not at all interested in doing. But one of the conditions is to harmonize our foreign policy with that of the European Union and that’s where Russia comes in. Joining the sanctions against the Russian Federation - there are some countries which pose this question at each meeting. You probably know which countries I’m referring to. They always criticise Serbia for not joining the sanctions against the Russian Federation. We’re surely not going to join the sanctions and in that sense we shall continue to develop good relations with the Russian Federation. ID: It’s not our position that we’re not on anyone’s side. We would like to be members of the EU but on the other hand we have good bilateral relations with the Russian Federation. And we have no intention to impede those relations just to become an EU member. On the other hand, all those who love Serbia have to take care of our national interests as well. Pursuing anti-Russian policies would be to our detriment. So we’re not sitting on two chairs, we have our own chair. SS: That’s exactly what the representative of the US State Department official Hoyt Brian Yee said: “You can’t be sitting on two chairs, you’d better choose”. Do you feel like America puts pressure on you at some point? ID: Well, he resigned, so I don’t have a response to his claims. I’m more into the view that Serbia should seek common ground with the Western interests in a sense that they should take an impartial stance towards us. We’ve had good relations with the United States and the UK. We were allies in wars but during the crisis of 1990s they practically diverted a lot from us, which resulted in their airstrikes against us. And then there was this operation ‘Storm’ in Croatia as well. Not to mention the unilateral declaration of independence by Kosovo. So in that sense it’s necessary for the Western countries to understand that there would be no peace in the region without searching for a common solution, without searching for something that is acceptable to all. And speaking about the relations between Russia and the US, we hope that there will be some sort of a warm-up in these relations. I was Chairman of the OSCE in 2015, it was the 40th anniversary of the OSCE. I read a statement then written in 1975 by then-president of Yugoslavia and the statement that was read in Helsinki - with a little adjustment for the times that’s exactly the statement that I could have made today. He was calling for detente, alleviation of tension between the blocs. Even Henry Kissinger recently said that he hoped there would be some warm-up in the relations between the United States and the Russian Federation because the next phase, if we go on like this, would be war. And no one should be stupid enough to enter a war that would lead to total destruction. SS: But Foreign Minister, you know, the best way to have a detente right now between America and Russia is to find a common ground for something. And I know that Lavrov has said that US and Russia could become part of the Kosovo-Serbia negotiations. Do you think an international mediation could help here? ID: We’ve never heard from the US that they would like to take part in those negotiations. That’s what the Albanians from Kosovo are saying. They are actually seeking the involvement of the US in addition to the EU. On the other hand, we have to keep in mind that those proposals are put forward, we have to acknowledge them. In that case we would like to invite the Russian Federation to join as well. In the talks that President Vucic had with President Putin and with Foreign Minister Lavrov and myself Russia has expressed readiness to join the process. But actually we don’t feel it’s necessary to expand this story right now. SS: I know that President Vucic supports dialogue with Kosovo, but in Davos he said that Serbia isn’t going to recognise Kosovo’s independence unless it gets something in return. What kind of concessions are you looking here for? ID: It’s been 10 years after the unilateral declaration of independence of Kosovo, and it’s still an experiment. Regardless of the fact that Kosovo has been recognised by some states Kosovo hasn’t completed its independence run, it hasn’t become a UN member and member of other organisations. There are a lot of countries that do not recognise it like Russia, China, India, Indonesia, Iran, Iraq, Brasil, Argentina, Mexico, Ethiopia, South Africa, Spain. Five EU members haven’t recognised Kosovo. Also over the past few months we’ve managed to have some of the countries revoke their recognition. It means that the process is still alive, it’s not over yet. No one can have a secession without an agreement with the country from which they wish to secede. In that sense we’re for a dialogue. Some European countries say that Serbia has to, that Serbia must recognise Kosovo’s independence. But that’s not a compromise. Serbia will never recognise the unilaterally declared independence of Kosovo. When the countries which advise us to do so, when they do that themselves, there are some other standards. SS: From the tone of President Vucic people gather that there may be some compromise. For instance, I know that Serbs who live in Kosovo have enjoyed a de-facto independence and have always been supported by Belgrade - now Belgrade wants them to integrate with Kosovars. What if, as an option, Serbia annexes the northern part of Kosovo populated by Serbs in exchange for recognising Kosovo’s independence? Would that be a working compromise? ID: We have our own proposals on how the compromise could look like. But the Albanians in Prishtina don’t consider it necessary to even enter a compromise. They don’t want to discuss, they just want to discuss that Belgrade should recognise their independence. That’s unacceptable for us. We can have discussions on all other issues, we have an internal dialogue on how to arrange the relations. But Albanians obviously think it’s enough to have recognition from some Western countries and that would make it a fait accompli. They’re wrong there. They have a false list of countries that have recognised them. They speak of 116 countries that recognised them. I’m sure it’s in the interest of all to actually find a compromise. But if they don’t want a compromise we shall continue our struggle. SS: What does the Serbian compromise look like? What is your proposal of a compromise? What would that be? ID: It’s not in the media that it should be discussed. I mean, with due respect to all I wouldn’t like to engage in this publicly. We could discuss these several times. I gave my own proposals and we didn’t come to a point that they would actually listen to our proposals. SS: Maybe they will listen to the media, if you say right now what you plan is! ID: It would be easier if I had to negotiate with you. They won’t listen to us at all. They just say ‘we’re independent and you have to recognise us’. SS: How do you feel about that? ID: They are just speaking out their mind. They are saying what they are also thinking. For them the purpose is greater Albania regardless of who will suffer the consequences and who will be blamed for that. But that’s their goal - unification of all Albanians. SS: Would you be against it? ID: They can create Albania if they want to but on the territory of other states. Surely, not on our territory. We want dialogue, we want dialogue to be successful, we want to reach a solution that is in the interest of all. But imposing a solution that we have to recognise Kosovo, giving ultimatums - that’s something that doesn’t work with the Serbian people. Somebody in the international community may be interpreting our wish to have a dialogue as a weakness. Maybe Vucic should also say that Republika Srpska in Bosnia should also have one president with Serbia. Maybe they would have respected us more if we said that. But we are suppressing the wish of Republika Srpska to unify with Serbia because we respect the provisions of the Dayton Agreement. Nevertheless, we are often criticised by the Western countries. Rama and other Albanian politicians are viewed as good guys. But there’s one problem. I’ve showed the map which shows all the terrorists coming from Bosnia and Herzegovina, I’ve showed it to Rex Tillerson, all the terroristswho fought in Kosovo and in Bosnia as Islamist fundamentalists. So they are not going to go after us now. Instead, they are going to turn their guns and kill them now. If the West doesn’t understand that now, it may be too late. SS: So, Foreign Minister, from this talk I understand that neither Serbian government nor Serbian people are willing to recognise Kosovo’s independence, a compromise is something very vague because, as you say, Albanians aren’t listening. But that’s the main stumbling point of your accession to the European Union. I know that German Foreign Minister has said that Serbia will have to recognise Kosovo to join the EU. How do you go from here? ID: Serbia and Yugoslavia in the past welcomed the reunification of Germany. And it’s not appropriate for Foreign Minister Gabriel to make a statement like that. He also said that he didn’t say that. And If he didn’t then I apologise to him. EU doesn’t have a common position on Kosovo. They criticise us for not accepting the common European foreign policy on Russia. So why don’t they figure out a common foreign policy regarding Kosovo? These are positions stated by those who recognise Kosovo. It is my opinion that there’s no price for Serbian recognition of Kosovo. If anyone thinks that for the sake of joining the EU Serbia would recognise Kosovo under the conditions that they impose right now and not on the basis of dialogue and compromise, they are very wrong. We want a compromise. But the solution proposed by Kosovo Albanians is a not a real solution. SS: I understand your arguments, and they are very logical. But the fact is that they demand this of you. Maybe not the German Foreign Minister himself, but the EU in general. That’s one the demands that you have to recognise their independence. What’s more important for Serbia - the accession to the EU by 2025 or recognising the independence? ID: No one has officially said this to us. EU cannot really stand by a position like that when it has five members that do not even recognise Kosovo. We cannot expect Spain to be more Serbian-oriented than the Serbs themselves. No one can demand those things of Serbia. It’s humiliating us. Serbia seeks good relations when it joins the EU. But what they are telling us, they should be telling Prishtina as well. They should tell them that there’s no European perspective, no path to Europe unless you reach an agreement with Belgrade. They tell us that there’s no such perspective - they should tell this to the other side as well, say that there will be no European path to them unless they reach a compromise. And so we'll see if there are really double standards in their behaviour. I know an answer, I can tell you this immediately right now - yes, there are double standards. But we’re not going to fall for that. This is my opinion. Maybe there will be some other government in Serbia that will accept it, but I think this is not going to happen in our generation. SS: But see what’s happening from the other side - EU wants to see Kosovo as a member, Kosovars want to join the EU. How would Serbia feel about that if Kosovo got an EU membership? ID: Kosovo cannot become a member of the EU. Let me point out that you should be reading carefully what the documents of the European Union says. They have an agreement of association with Kosovo but this is, so to speak, a mini-agreement, so they agreed with Kosovo not as a state, but as a territory, with this special way of marking it exactly for the reason that there are five members that haven’t recognised Kosovo yet. This agreement hasn’t been ratified by all countries but was recognised by the European parliament. We should be very clear on that. If there’s no agreement in the union, if we don’t reach a compromise, it is very difficult for Kosovo to become part of the EU. And they should be told so. Someone should be telling them that. In this sense some feel that this case was finished in 2008. No, it hasn’t been finished. If that was the case, why would they be pressuring us now? Why is that important for them what we have to say? Obviously, this affair isn’t over yet. SS: Ok, let’s pretend that Kosovo issue is not vital for Serbia joining the EU. Let’s just talk about the EU criteria that have been put forward for Serbia to join the union. I know that Vucic said that they are so harsh that it’s almost like climbing Mount Everest. Could it be a European plan to make it so hard for Serbia to enter the EU that you won’t enter? ID: When he said that he was referring to Kosovo. And the fact that the EU, regardless of the lack of a unified position, probably most of its members would like Serbia to recognise Kosovo … We’re for a compromise and the Albanians don’t want to discuss it at all. That is why it is difficult. It’s difficult because only one side is exposed to pressure. In that sense Vucic said that there were great obstacles before us but that has been known to happen to someone who climbs the Himalayas and Mount Everest. ID: Frankly speaking, joining the EU is a complex process which should imply progress and reforms in all segments There’s 35 chapters. But as far as Serbia is concerned, I have to be very frank, they are not very really interested in how much progress Serbia has made. They are more interested in how much progress was made regarding Kosovo. So even the dialogue was burdened with political connotations and that’s what really bothers us. The only thing that they are going to consider is whether or not we’re going to accept some sort of concessions in dialogue with Prishtina. SS: Yeah, because the EU strategy also says that “none of the Western Balkan states can be considered a functioning market economy”. I mean, Serbia has just completed a 3-year IMF programme with flying colours, the economic results exceeded expectations - if you’re not a market economy, then what are you? ID: There were some proposals to form a joint market in the Balkan region. But many in our region are allergic to proposals aimed at unity because that reminds them of former Yugoslavia. For example, Kosovo, Montenegro and some other states were not willing to accept such proposals like that because they see them as something where Serbia would be dominant because Serbia by size is bigger than many others combined together. It would be as if someone in the EU says ‘we don’t want a common European market because Germany would be dominant there’. There are many obstacles that are not related to Kosovo. We should be working on those, of course, strengthening bilateral relations, searching for resolution of disputes between the former Yugoslavian countries and, of course, encourage economic development. SS: Then there is also Serbian people and how they feel about joining the EU. For instance, I have a survey from the Regional Cooperation Council which says that only 17% of Serbs believe that their country will be part of the EU by 2025. And 33% say Serbia will probably never even join. There’s a joke that I read: what is the difference between optimists and pessimists? An optimist thinks that by 2025 Albania will join the EU when Serbia is the EU president, and a pessimist thinks that Serbia will join the EU when Albania is the EU president. Why is there such a discrepancy between what the government wants and what the people want? Why such disenchantment from the people of Serbia? ID: I think it’s a reaction to the permanent switch of the terms both in internal and external politics. When you talk about the internal politics different politicians give promises usually on the eve of the elections and then nothing happens. On the other hand the EU often gave, so to speak, moving targets - they tell you to do something and then they tell you to do something else. The way the EU citizens are tired of enlargement, the same way the citizens in Western Balkans are tired of reforms. In that sense, perhaps it’s realistic for Serbia and Montenegro to become EU members in 2025 if we conclude negotiations. But other countries are not in that package. Perhaps not all of them will enter at the same time. They call it the ‘regatta principle’. SS: I have one last question about China if you don’t mind. I know that China has been heavily investing in Serbia over the last couple of years. And that leaves many in the EU worried. Maybe that’s why they want Western Balkan states to become part of the EU by 2025. Will you be willing to give up all those Chinese contracts for EU membership because they do not conform to the EU norms and standards? ID: Some countries in the European Union are jealous and opposed to the strengthening of our economic cooperation with China, or Russia, for that matter. But that doesn’t mean that the same is true when they are involved with China. Look at it, Angela Merkel goes to China and brings along businesspeople and then signs a lot of contracts in China. North and Central Europeans agree to the Russian project North Stream 2. That’s ok when they do it. And when we want to do the South Stream gas pipe then it’s not ok. We are not going to violate any standards, any principles regarding regulating the economic deals. But with China and Russia we are strategic partners, we have agreements. We have such agreements with France as well. We shall surely continue that cooperation. So far Russia is a bigger investor than China. And we like that, we welcome that, we are happy, as we are happy to welcome any other country which isn’t coming to us by military airplanes. SS: Foreign Minister, thank you very much for this interview. I wish you all the best of luck with everything and I hope we’ll see you soon.